Implants provide a permanent solution to tooth loss and can be as comfortable and strong as your natural teeth. Dr Rob Montgomery, uses only the highest quality materials made by Swiss manufacturer Straumann, a global leader in implant, restorative and regenerative dentistry. Titanium implants are placed in the bone and allowed to fuse naturally with your bone to create a strong support for a cosmetic crown. They can be used to replace one tooth, several teeth or all your natural teeth, creating a healthy natural-looking smile without the need to modify surrounding teeth. The implant and crown are ergonomically-shaped to fit your mouth perfectly, allowing you talk, eat and smile with complete confidence. Dental implants are often the first choice for restoring missing teeth. Implants look and feel like your own teeth. They offer a very high success rate, approximately 97-98%. Implants take the place of the missing teeth. This avoids the need to shape and reduce the adjacent teeth to allow a bridge to be constructed. Straumann Dental implants provide a lifetime guarantee on all their components. Just like natural teeth, they look, fit and feel like part of your own mouth. Implants are very durable and last for as long as you care for them. Improved speech, unlike poor-fitting dentures, which can slip in the mouth causing slurring or mumbling. Implants can be used in some cases to stabilise dentures—your dentist can advise whether this would be suitable for you. Improved comfort, particularly when eating your favourite foods. Greater self-esteem, because they give you back your smile. Convenient and easy to maintain—dental implants can be brushed and maintained exactly the same as your natural teeth. Initially, you will be invited to Shadwell Dental Care to carry out an assessment to determine whether you will be suitable for implants. This may involve x-rays and models of your teeth to assist in planning. In most cases, anyone healthy enough to undergo routine dental can be considered for Dental Implant treatment. Patients should have healthy gums and sufficient bone for the implant. They also must be committed to good oral hygiene and regular dental maintenace. Your treatment is bespoke to the person and a treatment plan will be formulated taking into account your wishes and how we can help achieve them. You may also be referred by your dentist for a 3D CT scan to assess the volume of bone and to view important structures such as nerves and sinuses to make sure your implant works perfectly for you once it is fitted. We will then send a letter containing a detailed breakdown of your discussion, when your next appointment will be and the fees involved to make sure you are entirely happy before proceeding. Placing your dental implant is a relatively simple process. It is placed under local anaesthetic. Once the titanium implant is placed into the gap left by your missing tooth, we can fit a temporary crown so that thorugh the procedure you are never left without a tooth. The implant is left while the bone cells fuse directly with the implant's titanium surface. This usually takes between two to four months. This normally requires two to three appointments. Impressions or scans are taken of your teeth and sent to our technician who will then design your abutment (post) that attaches to the implant and emerges from the gum. Your dentist also will match the colour of the new teeth to your natural teeth. The final cosmetic crown is then constructed so it fits harmoniously in the space so that the final tooth looks and feels like your own natural teeth. Instead of one or more individual crowns, some patients may have attachments placed on the implant that retain and support a removable denture. Again, you can discuss with your dentist whether this would be suitable for you. Patients may also be able to have a permanently-fixed denture to replace a whole arch of teeth. In contrast to traditional dentures, which can slip, causing discomfort and problems with eating and pronunciation, the fixed denture will look and feel like your normal teeth? 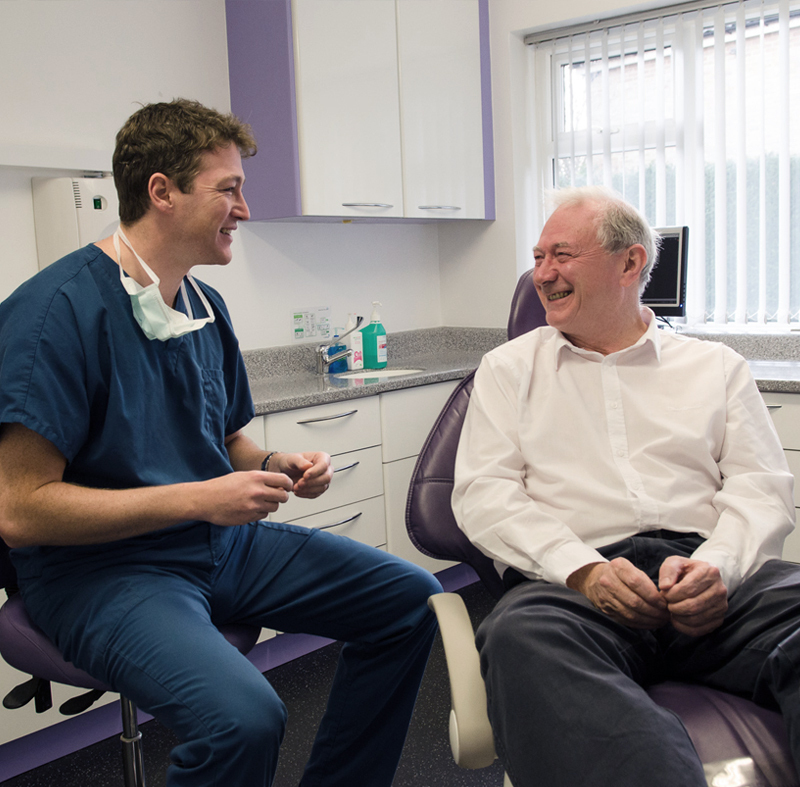 Whilst your implant retained teeth are designed to last, you must be motivated to attend for regular dental maintenance appointments which will often include appointments with the hygienist so that the health of the implant is maintained for years to come. We can offer a complimentary Implant information pack to offer further detailed information about implant treatment. Please contact us.